The Russian Orthodox Church has no information about the fate of two metropolitans abducted in Syria. “No concrete information has been obtained about their whereabouts, despite the efforts being made,” Metropolitan Hilarion of Volokolamsk, the head of the Synodal Department for External Church Relations, said at a press briefing in Moscow. “We do hope they are alive, that we will learn where they are, and that they will be freed very soon,” he said. The Russian Orthodox Church does not remain on the sidelines of the problems facing Christians in the Middle East and it will use all available mechanisms to change the situation for the better, he said. 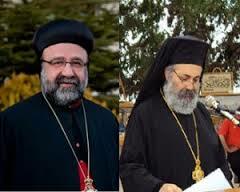 Mass media outlets reported that on April 22, militants of the Syrian opposition captured two Christian bishops near Aleppo – Orthodox Metropolitan of Aleppo Paul Yazigi and Syriac Orthodox Metropolitan of Aleppo Youhanna Ibrahim.